Dear reader we have few idea about pile concreting; here we like to include BNBC requirements for concrete in piling work. We know that concreting can be done by tremie method and drop bottom bucket. Here we will learn about which method is suitable for what types of piling work. Our aim is to produce and place concrete in such way that it precludes segregation in bored or cast-in-situ piling operation. Here we will use deposit instead of placing of concrete, as in this case this word seems perfect. 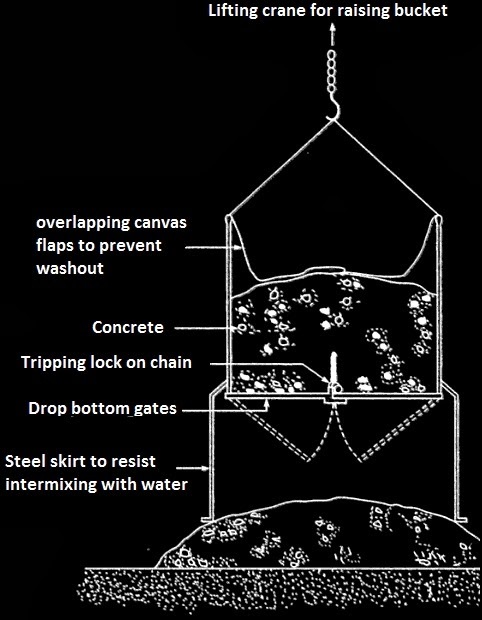 For a small diameter hole drop bottom bucket method is ignored and tremie method is adopted. In case of under-reamed piles, concrete should have slump of 100 mm. In case of providing concrete in water free condition in borehole, the slump should be 150 mm. In case of tremie concreting slumps of concrete are kept within (125-150) mm. Dear reader there has some requirements of cement content and strength of concrete for different piling conditions and way to concreting, which we will learn in our next post.